I started hunting through my stash for something suitable to dye, and saw the dyed fibre. “Why not just spin that up? ", I thought. I had four 50-gram lengths of top. Two were dyed in a 7-step progression from blue to teal. The other 2 went from blue to teal in 5 steps. My plan was to spin them up and ply against each other, letting the colours fall where they would. 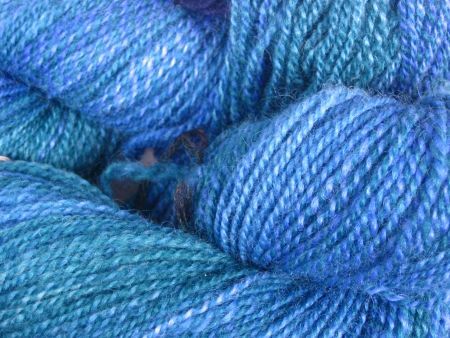 As it turned out, the colours didn't blend nearly as much as I had hoped in the plying, so there are very distinct lengths of blue and teal yarn, rather than more of the blue-teal barberpoling I'd hoped for. There was more variation in the dyeing than I had expected, though, so I decided to mix things up. I tore each of the 4 lengths into 6 strips, and put 1 strip from each length into a bag: I had 6 bags holding 4 strips of top. The strips varied in weight, so I spun different amounts of singles yarn from each length. I spun 8 strips onto Bobbin A, and 10 strips onto Bobbin B. The remaining were spun onto Bobbin C, which was wound into a centre pull ball to facilitate plying. I plied A and B against each other, and when A emptied, I joined in an end from the centre-pull ball. When B emptied, I started a new bobbin and plied both ends of the ball. Then I followed a tip from Jeannie Bakridges, and wound the 2 ends together into another ball, then plied that doubled strand til it finished. It was easier to wind the singles double and then add the ply twist, than to ply directly from the centre-pull ball. (Thanks Jenny!) But you still have to be careful to get the singles correctly lined up, or you'll get snarls and other nasties happening. As it turned out, I ended up with 4 skeins of yarn. 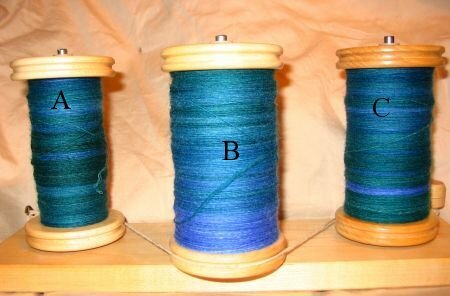 A "skein" was either when the bobbin was filled, or when I worked with the 2 ends of the centre-pull ball. 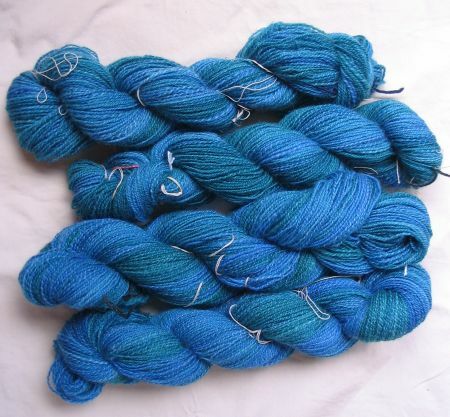 Because of the way I plied, I realised that where Skein 1 ended was where Skein 2 began in terms of the colour sequencing: likewise for Skeins 3 and 4. I thought that Duffy might like to have the colour sequencing available when she works with it. (People sometimes comment, for example, about how changing balls in Noro yarns forces a big break in the colour sequence.) So I put a green marker on the end of Skein 1 and the beginning of Skein 2; an orange marker on the end of Skein 2 and the beginning of Skein 3; and so on. When Duffy knits and comes to the end of a skein, all she has to do is match the coloured markers. 200 grams wool top. Don’t know the breed; possibly Falkland, likely standard Louet issue. Dyed on New Year’s Eve 2006, using Jacquard Sky Blue #621 and Teal #631 dyes. Singles were spun and plied using the fast flyer on a Lendrum upright wheel. I saw it on Duffy's blog. I agree that it is quite nice. Nice to hear how you did it. Oh yes. Quite nice indeed. You are a master of the understatement. Heavenly colours. I always say you can't have too much bluey green or greeny blue yarn, although anybody looking at my stash might disagree. He didn't lose out in the deal. I sent him Moonstruck chocolates, Stumptown coffee, and blackberry/huckleberry jam from the Pacific NW. The yarn is very nummy. I've been spending the afternoon thinking about what I could do with it. My gram scale isn't sensitive enough to measure a couple of yards to figure out yardage, but I'm sure I'll come up with something nifty. My head is spinning with As and Bs (that's gotta be because I don't know much about the process) but that is very beautiful yarn. That's quite nice the way creme brulée is sort of tasty. Damn, Ted, you impress the living hell out of me. I too have a niddy noddy that produces no standard skein lengths. I measured the length of one skein (30 in.) Count the strands in 1 side of the skein (say 120) times 2 times 30 divided by 36, voila! Pretty accurate measure for your yardage. Then I kind of eyeball any other skeins and guesstimate. I've never run short for a project doing it this way. I love the colours in that yarn (blue, always the best) and the nice firm twist. Great job, Ted. Lovely yarn! Some of us are just happy to be able to chew gum and walk at the same time much less have a plan to ply to such a beautiful effect.Very nice. very nice—she's one lucky duffy! Wow, Ted! I am in love with that blue yarn! You are really doing some impressive work, my friend!